Usus scribendi or vitia codicis byzantini? Is transmitted punctuation relevant to the reception of the text? • It is only in the last few decades that studies on Byzantine texts based on their manuscript tradition have addressed specific tendencies of Byzantine scribes with regard to punctuation, orthography, accentuation and enclisis, as well as the joining of words. Tendencies previously regarded as vitia codicis are today recognised as part of the oral delivery of the text and important for its understanding. Those related to accentuation and orthography were included in the critical editions at an early stage, but this has been hardly the case with the punctuation marks. Granted that they should be taken into account, is it helpful to retain exactly the same signs in a critical edition? •	No, especially if one considers the fact that punctuation theory and marks have undergone various modifications concerning their number, position and range of functions in the course of time, not to mention slight variations in punctuation practice between scribes. Do the transmitted punctuation marks suffice for the modern reader? How can they be implemented in the editions? In the case of diverging witnesses to the same text, which version should be preferred? •	These and other questions prompted the organisation of a workshop and the papers presented there have now been collected in this volume. 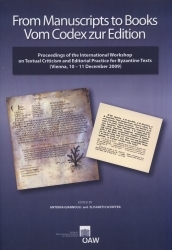 As demonstrated in these contributions, the review and explanation of the idiosyncrasies of the Byzantine scribes are crucial issues not only for the reconstruction of Byzantine texts and the editorial technique, but also for their literary interpretation. Contents: Antonia GIANNOULI, Introduction; Charalambos DENDRINOS, Palaiologan scholars at work: Makarios Makres and Joseph Bryennios’ autograph; Christian GASTGEBER, Das Patriarchatsregister von Konstantinopel. Aspekte der Interpunktion und Satzstrukturgliederung; Antonia GIANNOULI, Leon Balianites, Exegetische Didaskalien. Zur Interpunktion im Codex Escorialensis Y-II-10; Karin METZLER, Bibelzitate im apparatus fontium zwischen „Bibelsprache“ und spezifischer exegetischer Ausdeutung; Jacques NORET, Une orthographe relativement bien datée, celle de Georges de Chypre, patriarche de Constantinople; Sebastiano PANTEGHINI, La prassi interpuntiva nel Cod. Vind. Hist. gr. 8 (Nicephorus Callisti Xanthopulus, Historia ecclesiastica): un tentativo di descrizione; Diether Roderich REINSCH, Palinodien eines Editors (Matthaios von Ephesos, Kritobulos von Imbros, Anna Komnene); Elisabeth SCHIFFER, Codex Baroccianus 131 und Codex Coislinianus 278 als Überlieferungsträger von Texten des Patriarchen Germanos II; Raimondo TOCCI, Zur Interpunktion in Codices der Palaiologenzeit; Diether Roderich REINSCH, Nachwort.